AlphaCard Blog - How do I choose the right printer ribbon? ID card printers use unique ribbons instead of ink (with a few exceptions) to print your durable, high-quality cards. But if you’re new to ID card printing, you’re probably wondering how to pick the right ribbon when there are so many options and none of it seems clear! Let our ID experts, with over twenty years of experience, help you out. 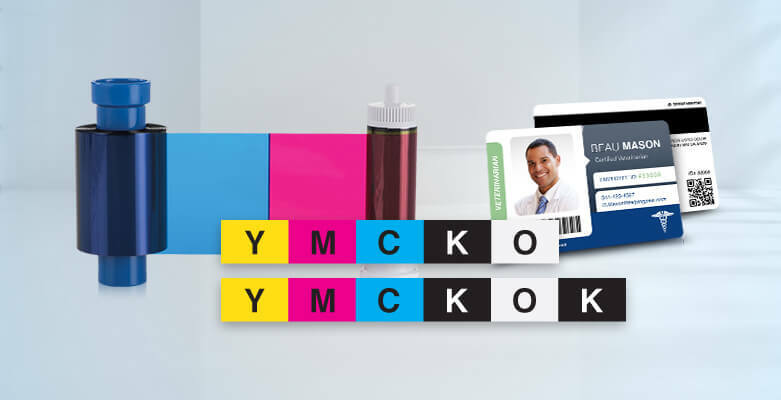 ID card printer ribbon names can seem weird and random at first – what could YMCKO 300 Print possibly mean? First, the YMCKO part NAMES THE PANELS on the ribbon – Yellow, Magenta, Cyan, blacK, and an Overlay. Using these panels, your printer can print any combination of colors and the overlay panel applies a protective finish. Next, the 300 yield lets you know how many SIDES OF THE CARD YOU CAN PRINT with this ribbon. So you can print 300 single-sided cards, or 150 dual-sided cards. Unless you need full color printing on both sides, using a YMCKO ribbon for dual-sided printing is not the most cost-efficient method – instead use a YMCKOK ribbon, which has an extra black panel (that extra K at the end) for printing monochrome black on the other side of the card. In this case, a YMCKOK 250 print ribbon would get you 250 dual-sided cards. YMCKO and YMCKOK ribbons are the most common, but you have many other options! We recently updated our website’s Ribbons & Supplies category, to make it even easier for you to find the ribbons you need. All supplies are now organized by printer brand and model, so you can see everything for your specific printer in one place. By Keisha|2019-01-29T19:40:03+00:00January 22nd, 2019|Ask AlphaCard, Ribbons|Comments Off on How do I choose the right printer ribbon?